Fall in Maine has always been my favorite season and every October in Charleston it calls my name. With each passing year, I’ve grown more and more home sick, longing for those crisp autumn days. I missed it so much, that this past August my family moved from South Carolina to Southern Maine for a year, to experience the beauty of New England...and fall! After a very hot Maine August, fall soon arrived. The season I waited over 14 years to enjoy, the season I was most excited for. But in mid November, we got snow. Not just a sprinkle of snow, we got inches of snow. Thanksgiving morning felt more like Christmas and just like that my favorite season became winter! 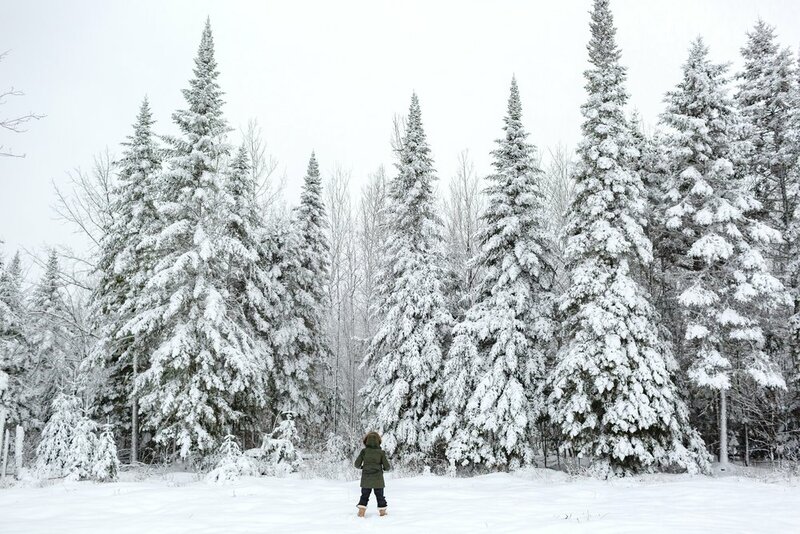 Isn't there something so magical about snow, how it completely transforms everything it touches? I forgot how alive the winter can make you feel. The snow soon melted away and for almost the entire month of December we didn't see any snow in Southern Maine, other than a couple of morning dustings. 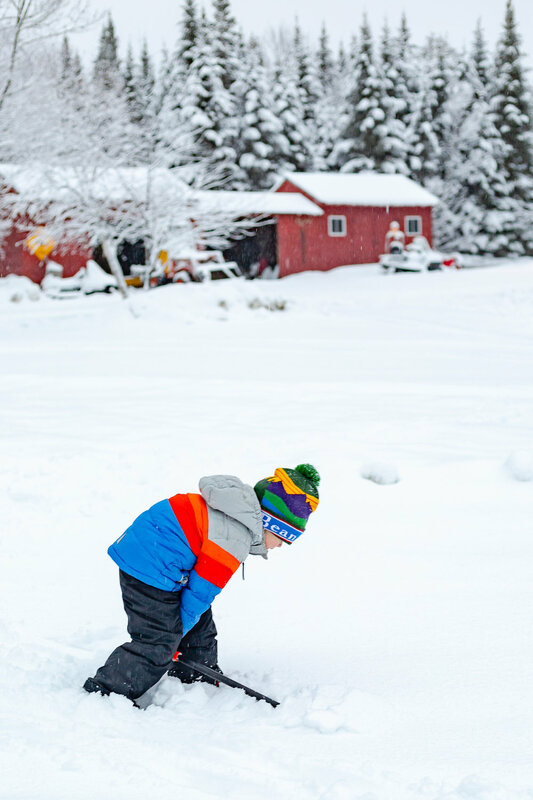 We missed it, just like I longed for the cooler days of fall...we longed for the snow to return to York, Maine. Christmas break arrived and after almost a week of being inside, we were all itching to escape to find some snow. 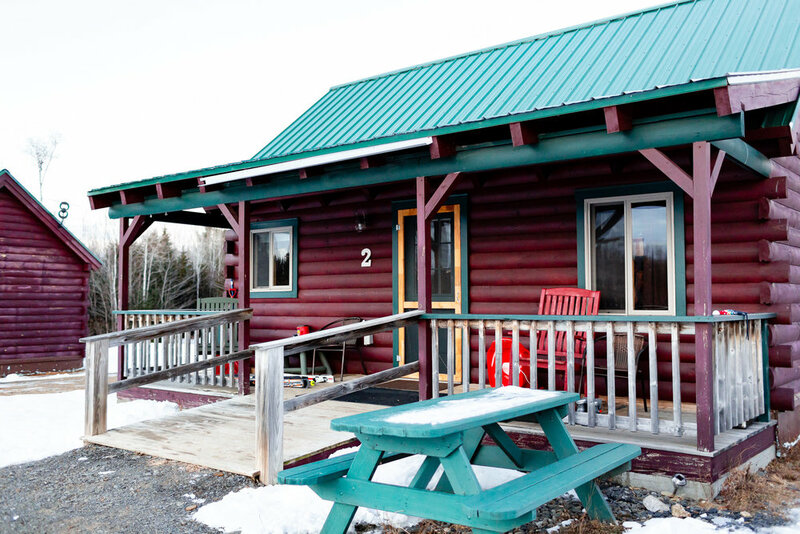 The New Year’s weekend was upon us, so with less then 24 hours, we booked our Airbnb and headed to Sebec, Maine! 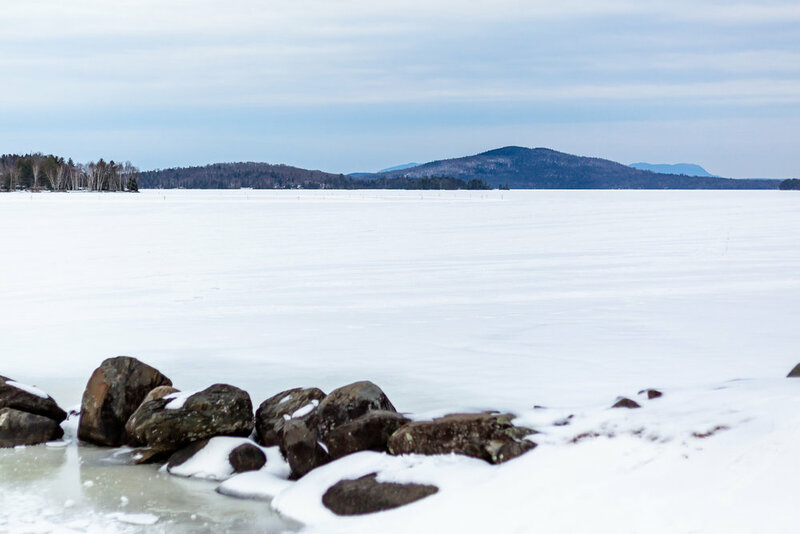 I had never been to Sebec or the Moosehead Lake area. The closest I had ever been was my summers spent at cheering camp in Bangor, Maine. 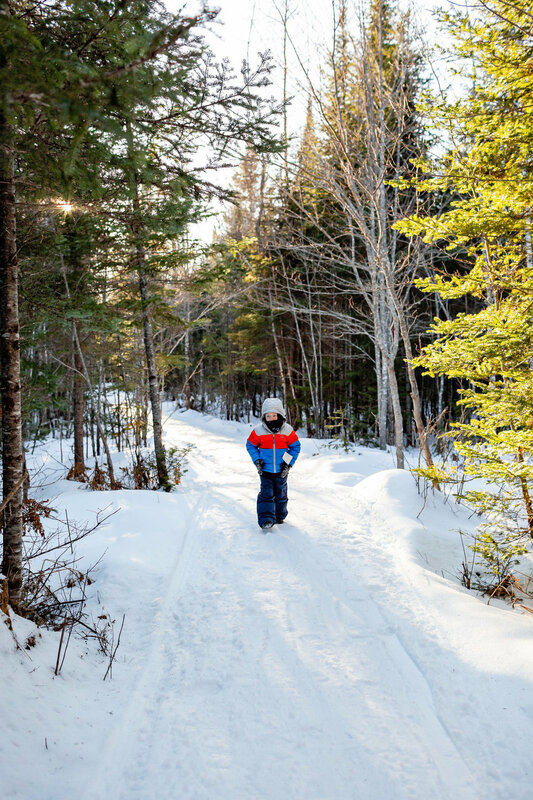 I knew nothing about the area, but my trusty weather app predicted snow that weekend and there was a ski resort about a hour away…so off to Piscataquis County we went! 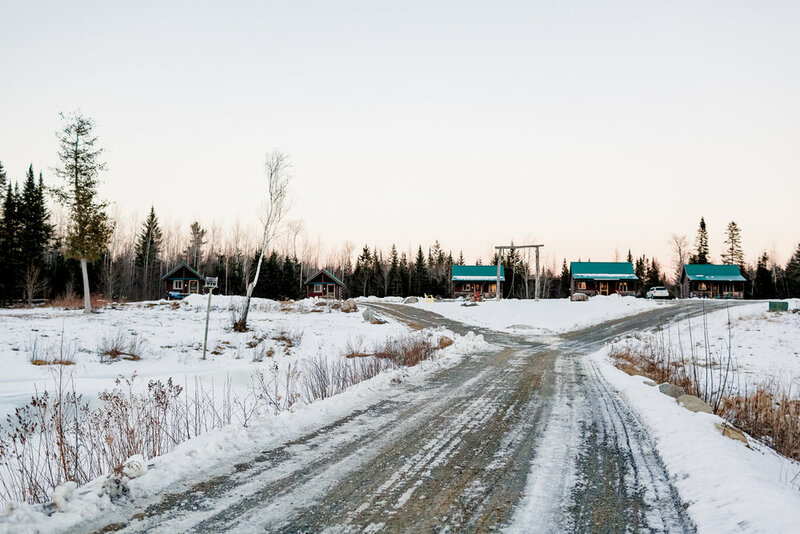 After 3 hours in the car, we finally arrived to the entrance of Pleasant River Guides: Wilderness Lodges and Cabins, our cozy log cabin in Maine. The drive down the dirt road was a beautiful adventure in itself. 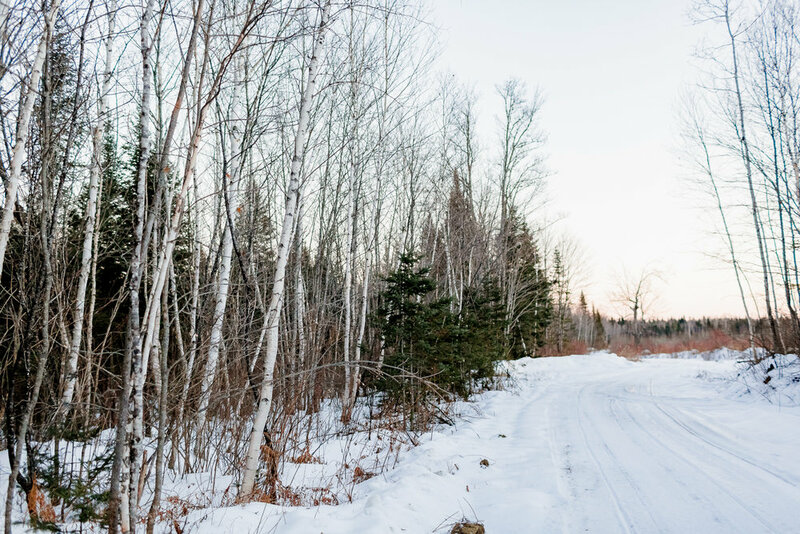 The 1.2 mile long driveway is surrounded by white birch and pines, which were covered in a thin blanket of snow. Small signs were posted along the path letting us know we were getting closer. We drove slowly, trying to take it all in and hoping to catch a glimpse of some wildlife...we were on a mission to see a moose. Finally we reached the main entrance! 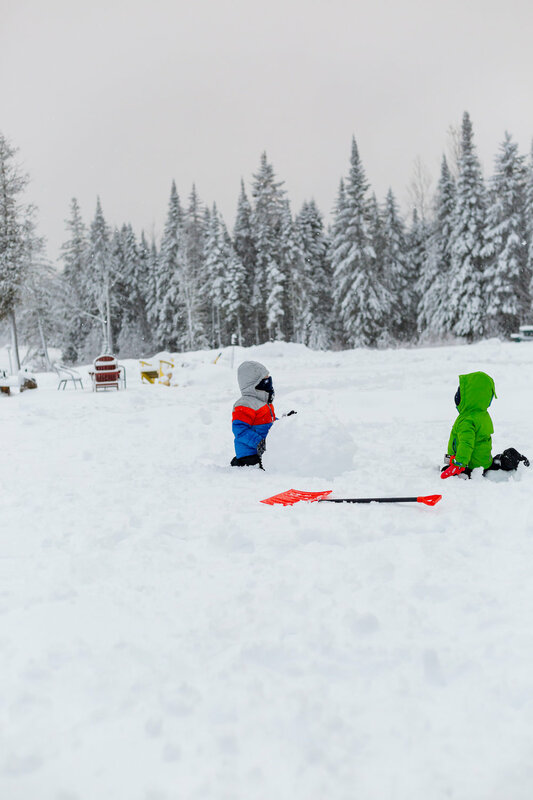 The property is a winter playground. 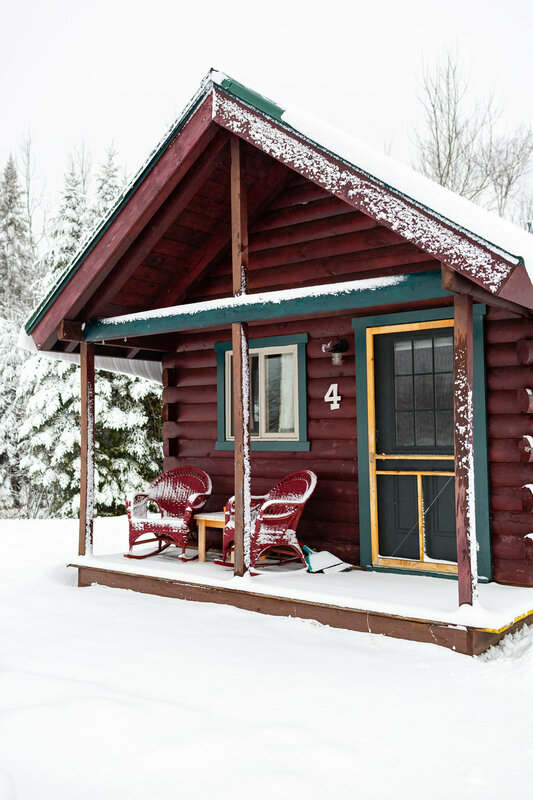 It has everything - a large frozen pond encircled in large pines, a babbling brook, multiple trails for hiking, hunting or snowmobiling, five quaint authentic log cabins and the main owner’s lodge. 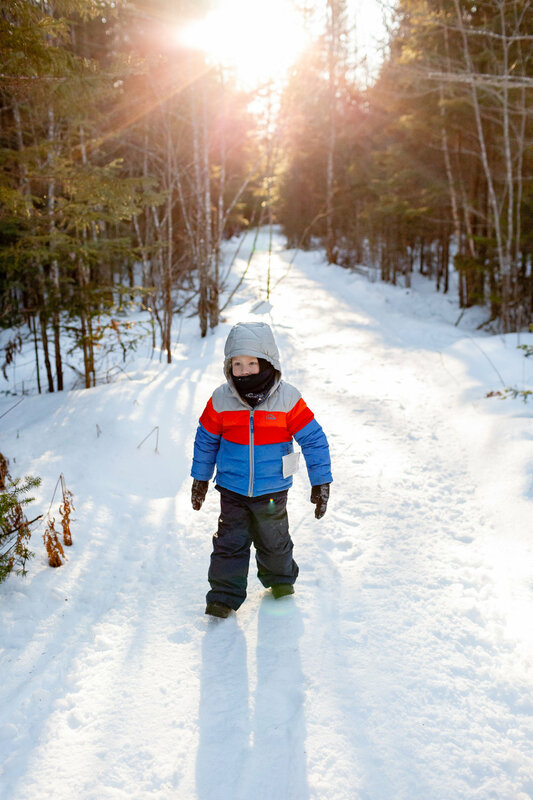 After checking in with the owner, Brenda, we quickly threw on our snow gear and headed to the wooded trail before the sun went down! 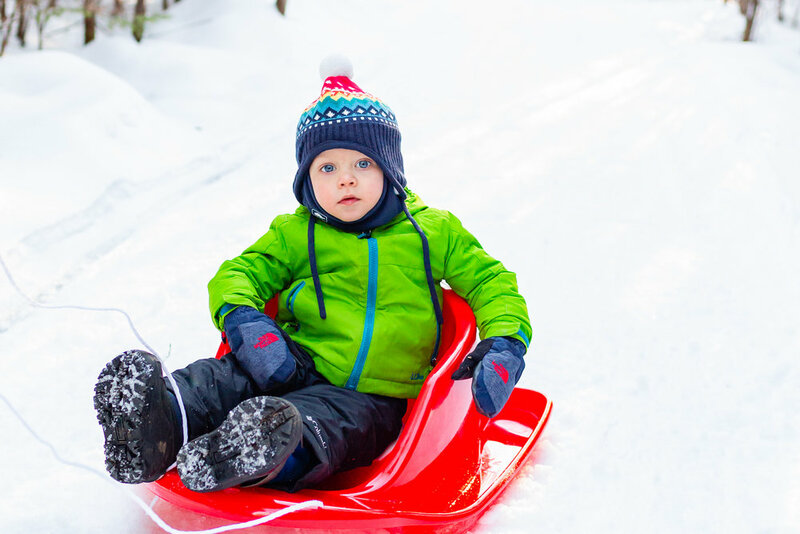 Like any road trip for our family, our car was packed to the brim with everything we could possibly need, including our new snow sleds. 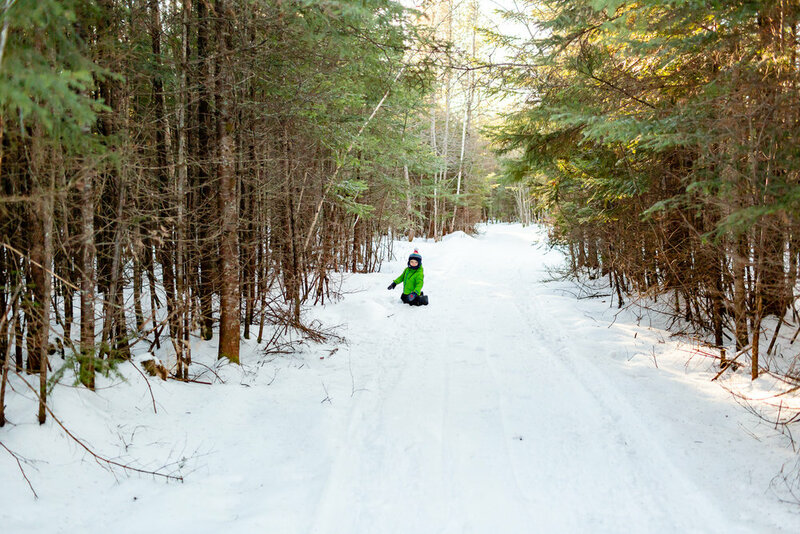 My boys took turns riding and pulling the sled through the path in the woods. 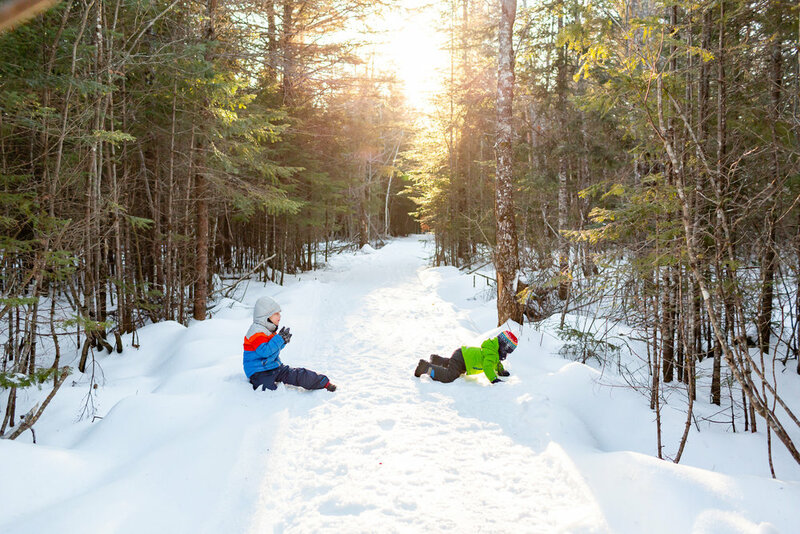 We took many pit stops along the trail, for rolling around and eating snow. The golden light coming through the tree canopy was a photographer’s dream. I couldn’t get enough of it! 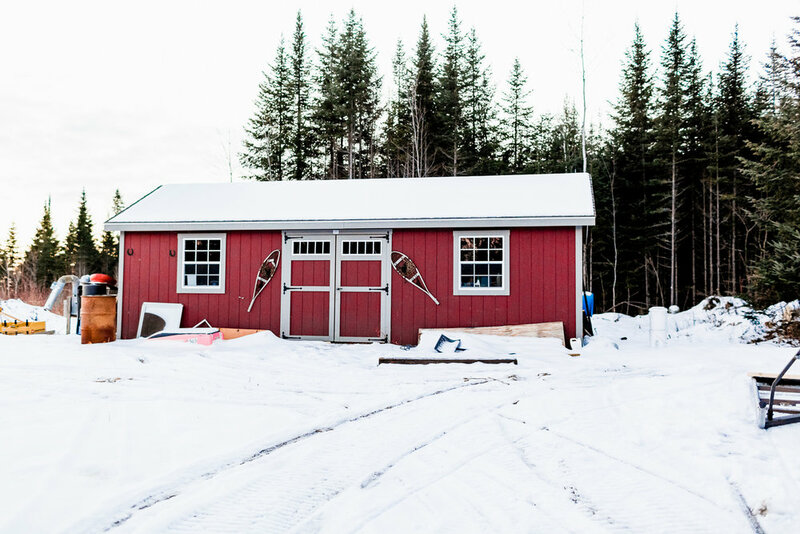 After our adventure through the woods, we headed back to our cabin to warm up, unpack and unwind. Eager to see more of the property as the sun went down, I grabbed my camera and headed out to explore on my own. I watched the sun go down, something I’ve been lucky to experience almost every evening since returning to Maine. That night we rang in the New Year, well sorta…we all fell asleep well before the clock struck midnight. 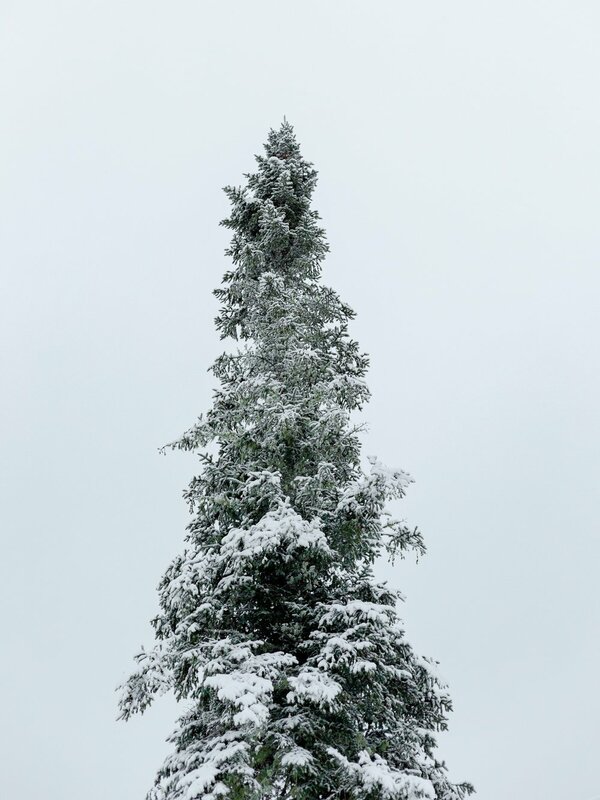 And to our excitement, on the first day of 2019, we woke up to a winter wonderland! 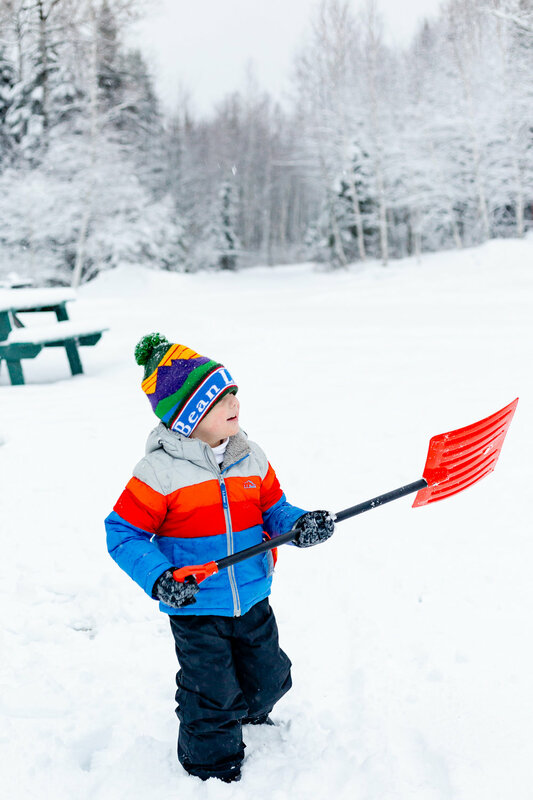 We spent our first day of the year as a family outside in the snow. 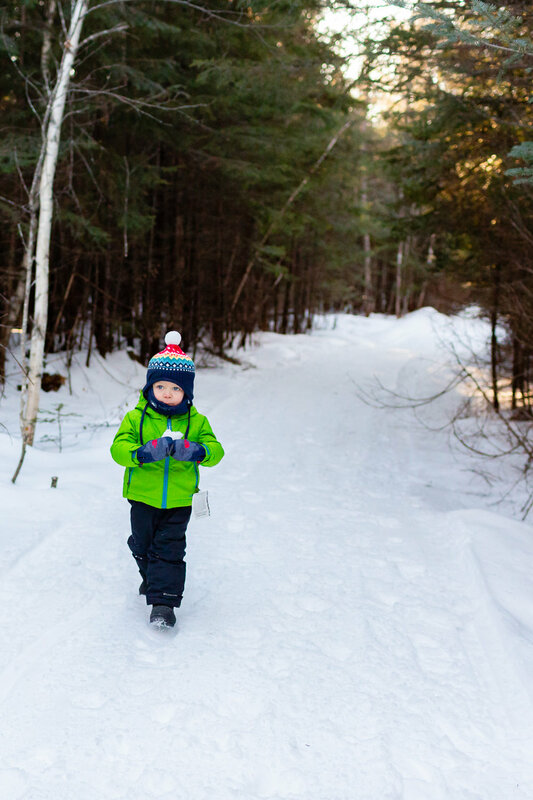 It was a day full of walks through the snow covered woods, snowman building, sledding and shoveling snow (most of it not captured on camera). It was a perfect day and a trip I will forever remember! I’m a mom of two young boys. Two energetic and very playful boys. Two boys that when stuck in the house too long will run you ragged. So when the weekend comes, we try to find something to do. 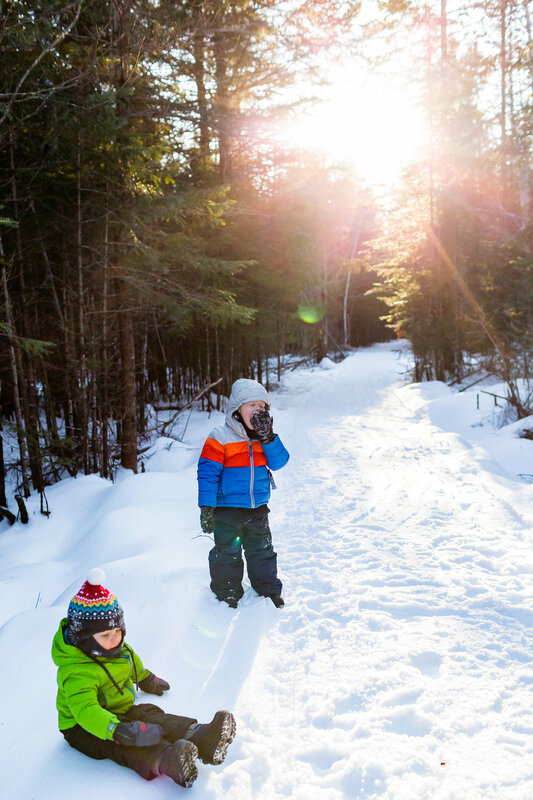 Something affordable (or free), something that gets us outside, something engaging and something that will hopefully exhaust them enough to fall asleep later in the day. I live for the weekends. 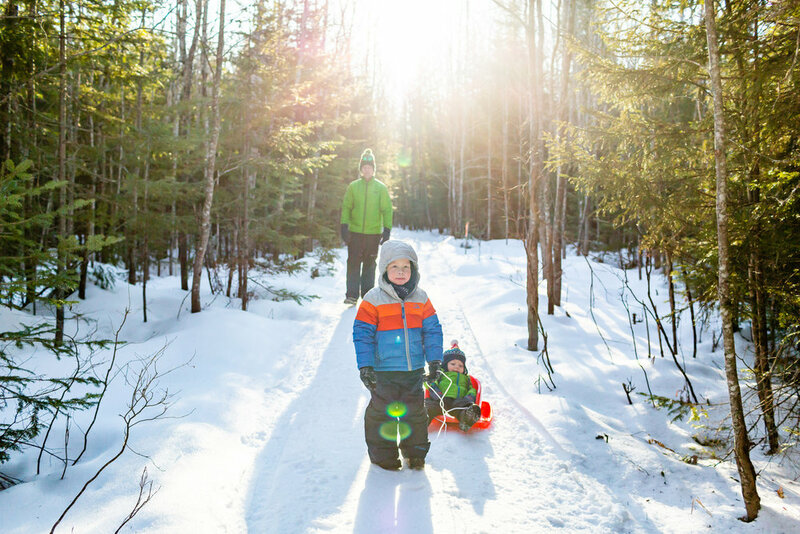 Not in the same way that I did before having kids — oh what I would give to wake up past seven o’clock and have a lazy Sunday — but in a way that I get to experience new things through them. 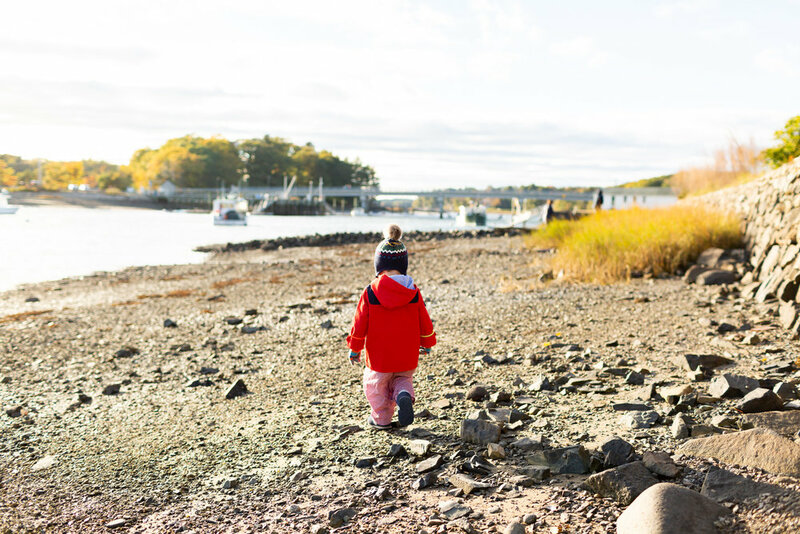 And moving back to the Seacoast area has allowed us to explore and experience so many things. The options here are endless. Overwhelmingly endless. 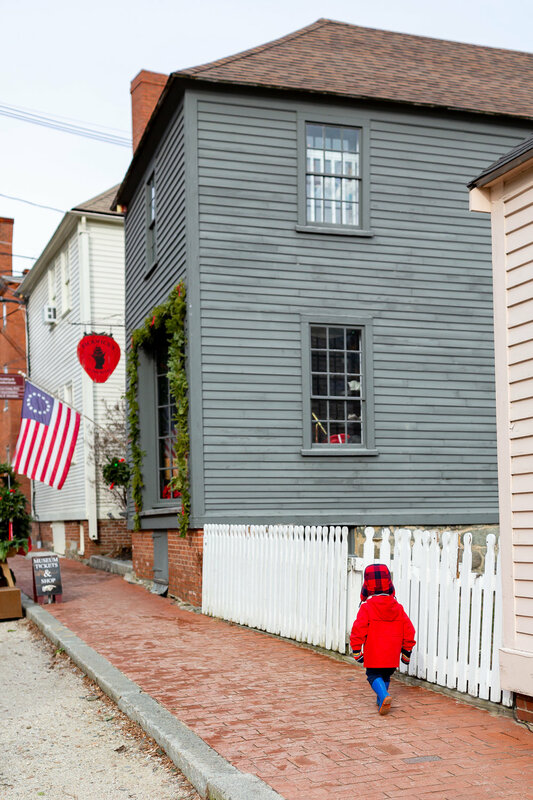 Portsmouth, New Hampshire is one of those towns that has so much to offer to families. It’s a beautiful port city, full of so much history. It’s my favorite town in New England. Growing up in Eliot, Maine, Portsmouth felt like my second home — just a quick drive over the bridge. I have some of my most fondest memories in this city, both as a kid and a young adult. 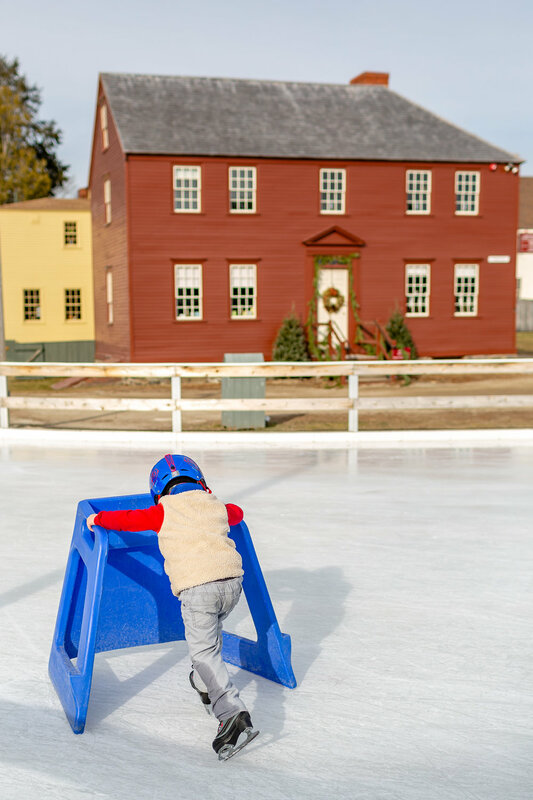 During the winter, Strawbery Banke Museum, a neighborhood in the historic south end of Portsmouth, opens their outdoor ice skating rink for families to enjoy. 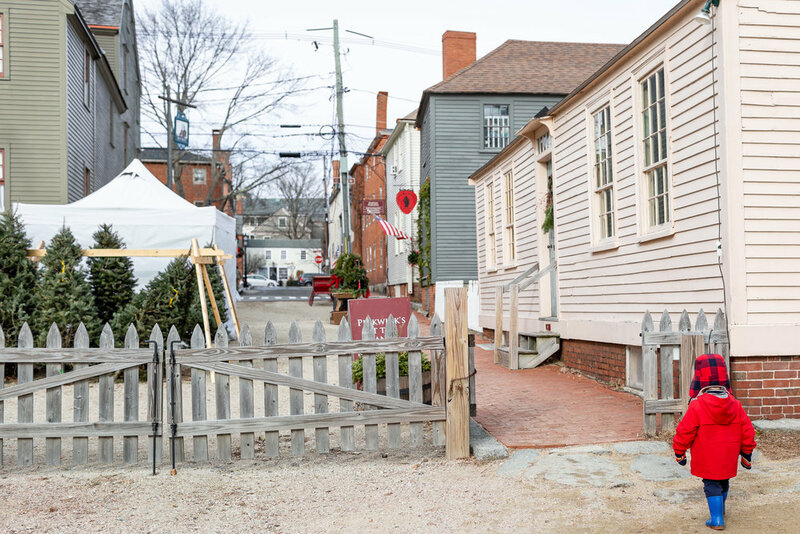 Puddle Duck Pond, located in the center of Strawbery Banke, is surrounded by colorful historic homes dating back to the late 1600’s. It truly feels like you’re transported in time. 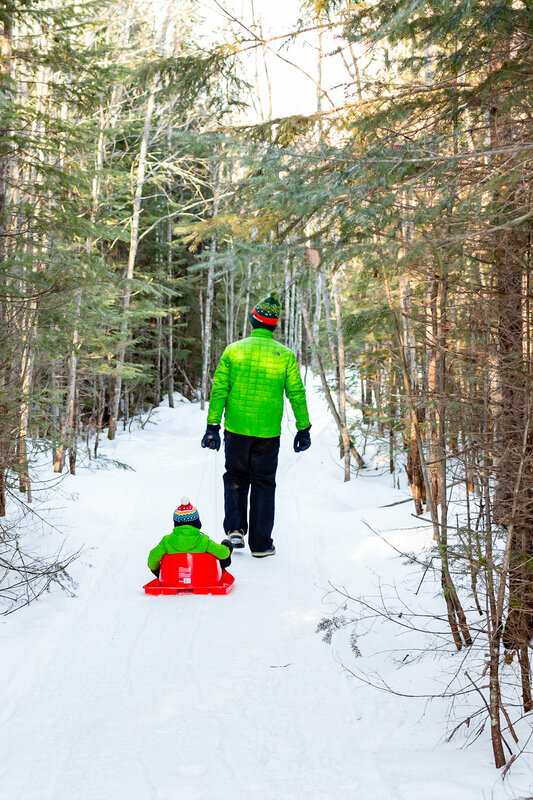 It’s the perfect family outing. Since we’re not seasoned ice skaters, I brought along our ski helmets, just in case of a fall. You can also rent skates for only $5 for the day, which my oldest didn’t want to give back. 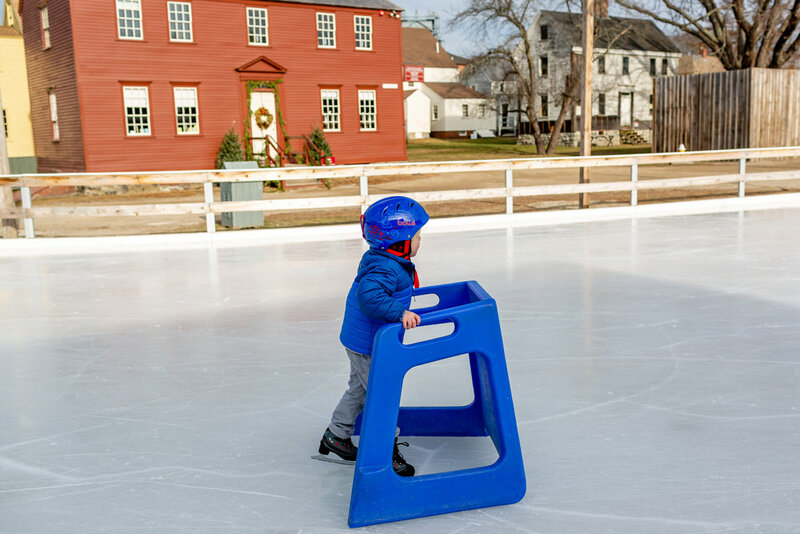 Along the entrance of the pond, are these handy blue kid skate trainers, great for beginner skaters like us. There’s also a cute café, Figtree Kitchen, located in the main building where you pay and rent. My little guy and I did a lot of watching from the sidelines. I’m the girl at the roller skating rink that holds on to the railing for dear life, pulling herself around (not that I’ve been on roller skates in at least 2 decades), so I didn’t do any skating during our first trip. However during our most recent visit, I gave it a try and really enjoyed skating with my boys! My oldest son, who is five, loves the ice. Puddle Duck Pond opened in late November and will stay open in March. 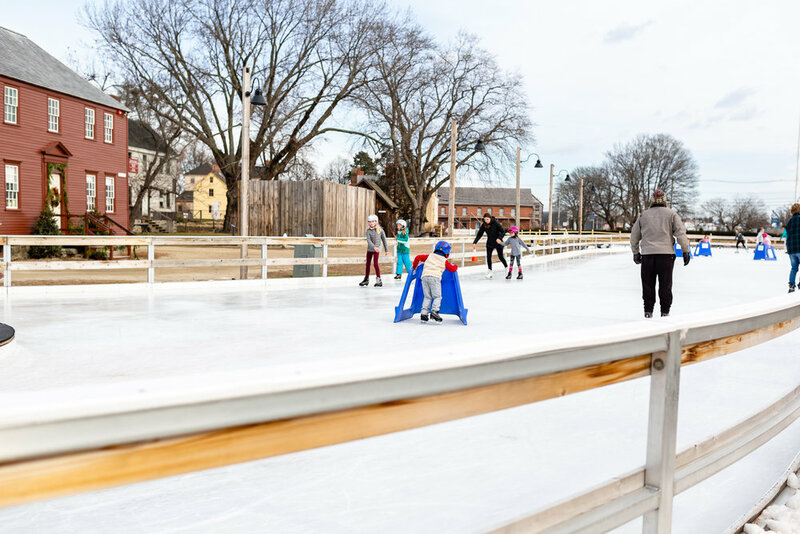 It’s open every day of the week and kids 5 and under skate free (win!). The pond is even opened in the evenings for night skating…how romantic is that! After watching for a bit, my two year old son, wanted to try. He was pretty unsure of the whole thing! 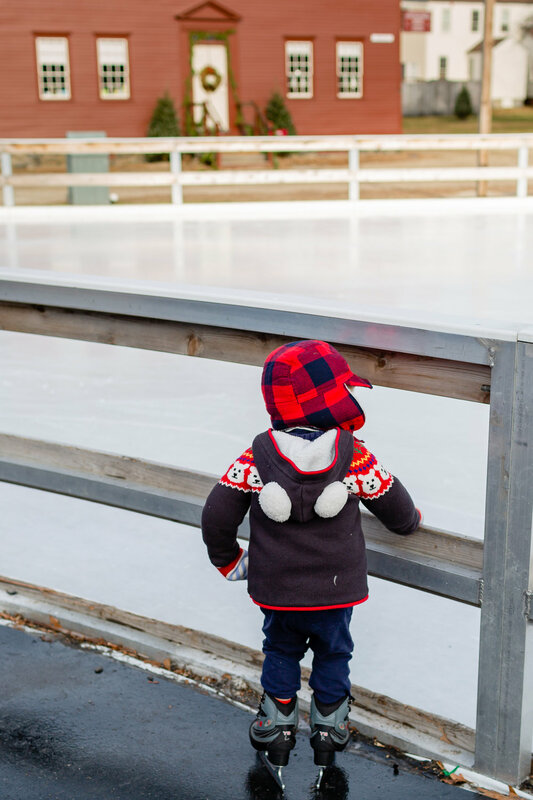 While my oldest skated and found new friends to race around the rink, my little guy and I explored the area. Our first time to Puddle Duck Pond was just a few weeks before Christmas, so all the houses were beautifully decorated for the holiday. 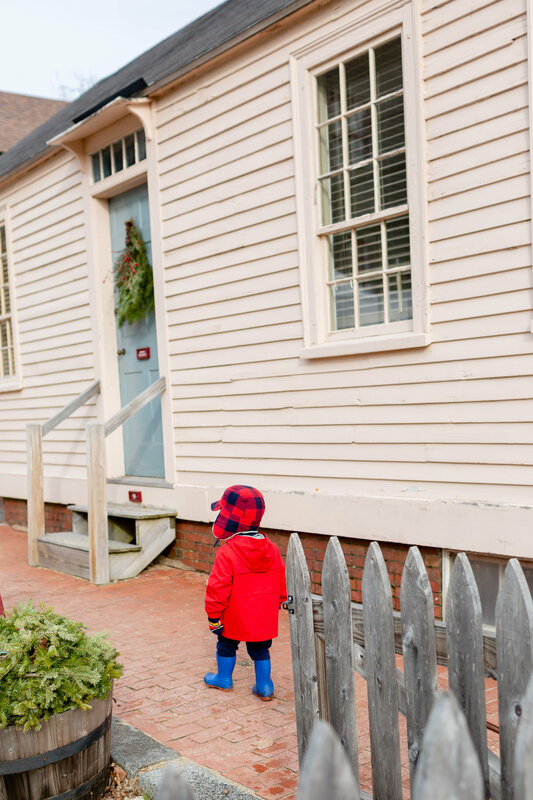 This is my favorite house at Strawbery Banke…just look at that color combination. 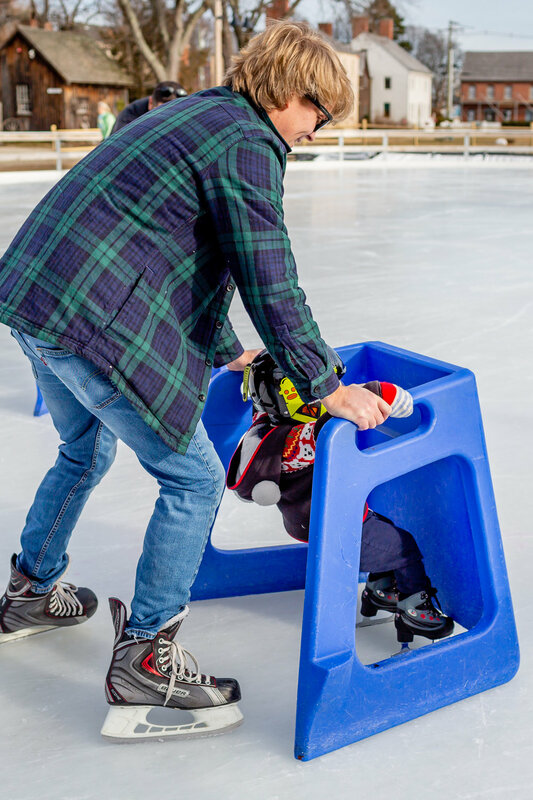 We had a wonderful time at Puddle Duck Pond and it was hard to convince my oldest to leave…and return his new beloved skates. We hope to return again before the skating season is over. While growing up in Maine, my mom’s side of the family (who all lived in Ohio) would caravan almost yearly to spend Thanksgiving with us. I have some of my most fondest childhood memories during those visits. Those holidays were full of so much food and laughter, site seeing and shopping, and good ole family fun. It’s probably been close to 20 years since we were all together back in Maine. So when I shared the news that I was moving back for the next year, they started planning a family reunion in Maine. This past week, my youngest son celebrated his second birthday and my sweet family was here to share it with us! After lots of birthday cake and balloons (per his request), we headed out on our favorite local trail. 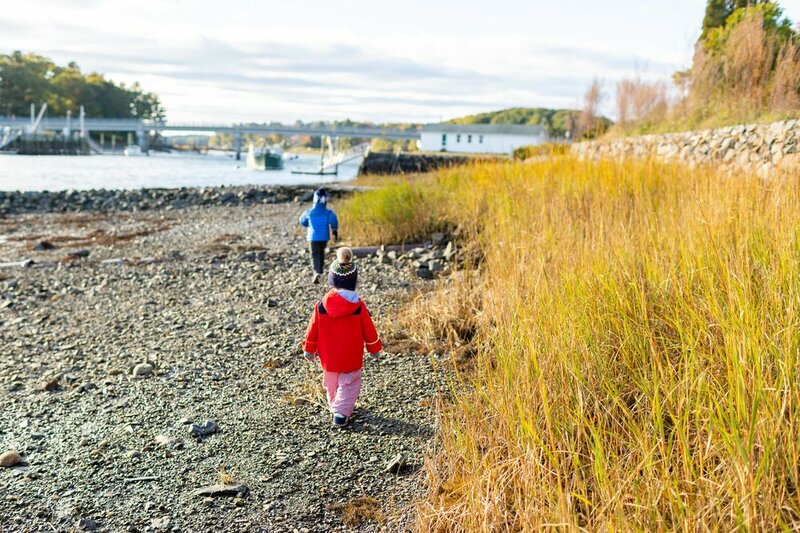 The Fisherman’s Walk is a short scenic trail that leads from the Wiggly Bridge and Steedman Woods over to York Harbor Beach and the Cliff Walk Trail (which is our absolute favorite). 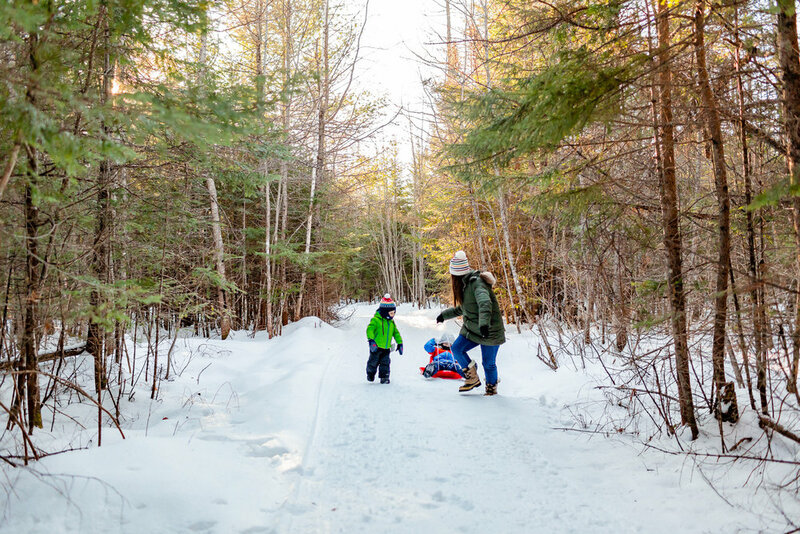 The trail leads along the York River with waterside views and it’s a perfect trail for kids, runners or dog walkers. 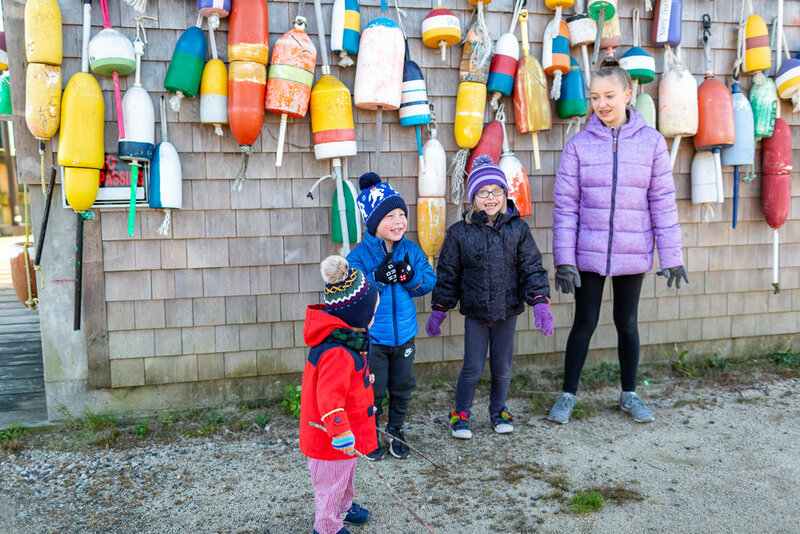 It was a pretty cold (cold for a someone who has lived in the south and in Jamaica the last 14 years) and windy, so we bundled up and headed out for our family walk. All the little cousins geared up for the brisk walk to the Wiggly Bridge. The view of the York River while on the Fisherman’s Walk. Unfortunately, the birthday boy was not feeling the walking, so I wasn’t able to snap any photos of the kids crossing the bridge, since he was attached to my hip. However, I was able to get a few of my Aunt leading the kids to the Wiggly Bridge in the distance. My oldest son loves shaking the bridge. It’s truly a “wiggly” bridge! There’s two trails once you enter Steedman Woods Nature Reserve, right off the foot bridge. Both trails are short and easy to walk, even for a just turned two year old. The paths make a circle around the woods, most of which have beautiful views of the water. We’re always straggling behind, in search of sticks for each hand! My mom (Meh-Maw as my youngest calls her) leading my boys through the woods. We’re also always looking for “treasures” when we’re out exploring. Once you reach the end of the trail, you can either continue on circling the woods back to the bridge or head further down through a neighborhood to the John Hancock Wharf and Warehouse. We decided on the latter. The Hancock Wharf was built in the 1740’s and I’ve read that it’s the only remaining building in York from the Colonial Period. Across from the Hancock Warehouse, is the wharf filled with buoys. It’s a fun and colorful spot to photograph, especially for kids. I can’t wait to see it once we get snow!! 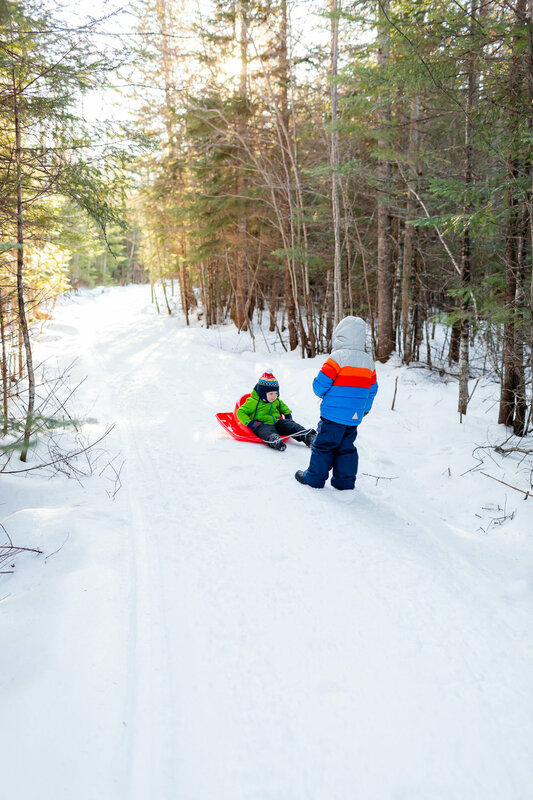 The kids jumped around to warm up, then we headed back through the woods to the trail home. As always, it’s sad to say goodbye to my mom and family. I loved having our house filled with guests and playmates for my boys. This past Monday, everyone headed back to their homes. I’m already missing the noise from the kids playing, the adult conversations, the day trips and lunches with my mom, and just catching up with family. Even though it was a short visit, I’m so thankful we were able to make new memories with our own little ones.